FDNY DART members and Red Crossers on the ground in Austin, Texas for Harvey Relief. Here are some highlights from last week and a preview of upcoming activities (see below). Over the weekend, the Greater NY Red Cross continued to deploy local staff and volunteers in response to Hurricane Irma. 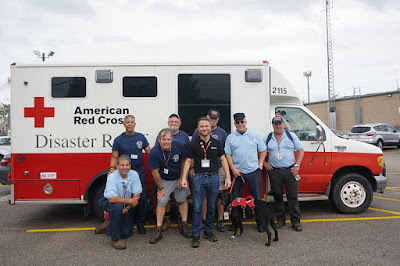 To date over 140 people have been deployed to the hurricane responses in Texas, US Virgin Islands, Orlando, FL, Georgia, and remotely in NYC, supporting the Virtual Volunteer Intake Center. On Saturday, the St. Aquinas Spartans Field Hockey Team, UPS and our Metro NY North Logistics Team held a memorable Giveback Day to help out the Red Cross Middletown Warehouse. On Thursday, the Greater New York was invited out onto the field of Citifield to celebrate the work of Red Cross volunteers and to highlight the announced partnership with the Red Cross to match contributions for Hurricane Relief Funds! Fios1 and the Larchmont Patch both spoke to Metro NY North’s volunteer Ed Merians just before his deployment to Florida for Hurricane Irma. Special thanks to the team at the Mazda of Valley Stream dealership for donating 4 new vehicles that will be put to use in disaster response. On Tuesday, with Hurricane Irma on its way, our Regional CEO Josh Lockwood joined Inside Edison to share how to pack a proper storm survival kit! ABC News went inside one of the shelters for Hurricane Harvey and gave an inside look of how donations are helping families. Earlier in the week, check out 5-time US Open Champion Jimmy Connors Interview with the US Open bringing awareness to the victims of Hurricane Harvey. Sep 12, 15, 16, 18: Red Cross blood drives will take place from 2 to 7 p.m. at the Greater NY Red Cross building located at 520 West 49th Street, Manhattan. Schedule an appointment to donate today. Oct 11: The American Red Cross Gala will recognize civic leaders and local heroes at the Museum of Natural History. Nov 5: There are 6 spots left on Team Red Cross to run the TCS NYC Marathon. Please join Amanda and run for an organization that's devoted to helping people who need help the most. You can register now at redcross.org/2017NYCMarathon. Thanks so much for the great information! So nice to hear the many ways people can and do help others in their great time of need! Great updates on what red crossers are doing. Thanks!